WordPress vs. Squarespace: Which is Best for a Business Website? No two businesses are entirely identical, and as such, no two businesses have the same needs. This is especially true when it comes to business websites. There are a plethora of platforms to choose from when it comes to building an online presence for your business. Selecting one, however, can be a bit tricky if you don’t know much about your options or how they compare. To aid in your decision-making process, we’ve pitted two of the top dogs against each other in this comparison of Squarespace versus WordPress. Each is a well-established platform in its own right, and each has an easy-to-use interface with a relatively mild learning curve. But there are some key differences that might make it obvious if either—or neither—of these options are best for your business. Both WordPress and Squarespace are examples of what’s known as a content management system (CMS). Essentially, a CMS is a tool (or set of tools) that makes it easy for those with little or no web design experience to get up and running as quickly as possible. 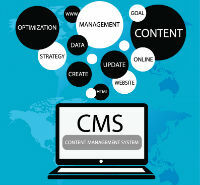 If you don’t have any coding knowledge or Web design chops, a CMS is practically a necessity. Without one, you’d have to learn a substantial amount about coding and Web development before you even think about building your site. Thankfully, though, CMSs are designed to have user-friendly, intuitive interfaces, which eliminate the need for an in-depth education. In short, they allow just about anyone to start building a website in only a few minutes. With most CMSs, customizing your site’s layout is as easy as dragging and dropping the different elements of the site, and placing them where you’d like them to appear. But before choosing a CMS, it’s important to spend some time thinking about what features and functionality you’d like your website to have. If your needs are simple, and you’re just looking for a website that informs the world about your business, products, and services, either of these platforms will more than adequately satisfy your needs. But if you’re hoping for your site to have some specialized functionality, such as an interactive appointment calendar or integrated e-commerce store, that’s when you’ll want to investigate these options more thoroughly. WordPress is a behemoth on the Internet. In existence since 2003, WordPress is the most widely used CMS on the planet, and is responsible for powering over 60 million websites worldwide, including nearly a quarter of the Internet’s 10 million most-visited sites. There are two main divisions of WordPress that continue to confuse many people: WordPress.org and WordPress.com. WordPress.org is where you’ll find free-to-download, open-source software that can serve as the backbone of your website, but which requires you to have a hosting company to keep your site online. WordPress.com, on the other hand, is your best bet if you want to use WordPress as both your CMS and your website host. It’s this distinction that makes it easier to draw comparisons when pitting WordPress.com vs Squarespace. One of WordPress’s greatest strengths—and arguably a component of its greatest weakness—is the open nature of the platform, which allows for the integration of thousands of tools and features that let you take more control of your website and expand its functionality. While this versatility can provide greater customization and control over a website, it can also make WordPress-based sites more vulnerable to attack. Many third-party plugins that work with WordPress are either poorly maintained or created with unintentional weaknesses that increase the likelihood of your site falling prey to a hacker or malicious code. Though Squarespace has been in existence since 2004, it took years for the company to become the powerhouse it is today. Similar to WordPress.com, Squarespace’s CMS is tied to its hosting ability, making the software and service a package deal. Those deals come in three flavors, which vary based on your business’s needs and if you wish to sell products online. When comparing Squarespace vs WordPress for business purposes, it’s important to note that Squarespace is not open-source, and does not allow the same level of customization that WordPress provides. That said, Squarespace sites also run less of a risk of falling victim to attack, due to the closed nature of their platform. WordPress or Squarespace: Which, If Either, Are Right for You? Both WordPress.com and Squarespace can help you build an attractive, easy-to-navigate website in as little as an hour, and each CMS has its own benefits and drawback. And although WordPress sites are considered to be more visible when it comes to SEO, the Squarespace vs WordPress battle shouldn’t be decided based on that feature alone. Consider your business needs carefully, and choose your platform wisely.